This may seem a bit obvious, but listening to what is being played by your fellow musicians is very important. If you’re new to this it may be a challenge just to hear yourself through all of the noise, but you must work to get past this. Listening to others is what gets you deeper into the music and will no doubt help you connect with the other players. The next time you are in a jam session try to isolate what you are hearing from each instrument. For example, if you play guitar try focusing only on the drums during a song. Once you can do that, try focusing on other instruments. Want to take it to the next level? Try to focus on two instruments at the same time! Or if you are focusing in on the drums try focusing on only one sound from the drums. I do this all the time – focusing in on the drummers high hats or snare drum can help me play along with him/her better. There is always something I can play that would line up perfectly with the pace/rhythm of the high hats or snare drum. Once you get this you will most likely never stop doing it. Now that you can listen to the individual instruments, try being able to hear the song as a whole. Initially this may seem a bit easier as it’s most likely the way you already hear music when it’s played on the radio. However, you will find that doing this while playing an instrument yourself is not the same. I think of this as using your peripheral vision, but with your ears. Peripheral hearing! Much in the same way that you tried directing your ears to the individual instruments, try hearing all instruments together. One way to make this easier is to try hearing the chords go by (changing from one to another) or hear the changes in the song. 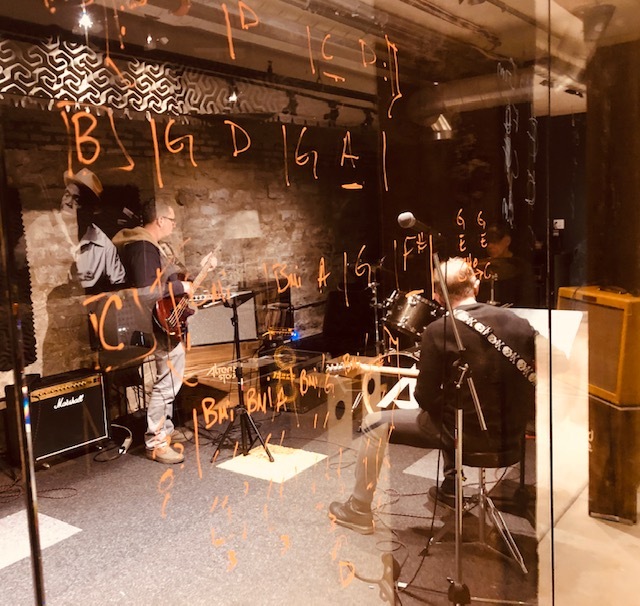 If you are a guitarist/chord player hearing the chord changes is easy, but try paying attention to when a drum beat changes or the general feel of the song changes. What will also get you hearing in this way is trying to anticipate the next big shift in the song or the transition into another section. The skills of listening and hearing for sure go hand in hand and they may even seem like the same thing. In a way they are, but I prefer to draw a distinction between the two. For me, listening is on a micro level where hearing is on a macro level. Listening will get you playing in a groove with the song and hearing will give you the freedom to stretch out within the song. I can go on and on, but try the exercises outlined above and see what you start to notice. These alone will set you apart from the average jammer.